☛ As always, you may click on any image below for a larger view. Joseph Warner Erwin was born in the Blockley Township section of West Philadelphia in 1824 to comfortable, upper-middle class parents. As a young man, he worked with his father as a conveyancer – a writer of deeds, leases and other legal papers. Like many young men in Philadelphia, he attended the theatres and cheered the star performers of the day, he promenaded with the other swells along Chestnut Street in order to see and be seen, he had late night dinners in oyster cellars, he went on picnics, he danced at parties both private and public all over the city and, luckily for us, he kept detailed records of it all. 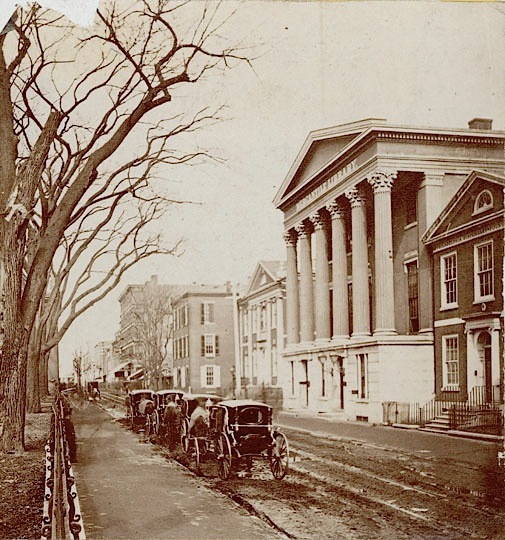 When his father died in 1845, the family moved to a respectable rooming house at 108 Walnut Street near Independence Hall and Erwin opened his own office nearby in the Mercantile Library Building, left, on 5th St., below Chestnut St., just south of the Philosophical Society’s Library Hall. Erwin began his journal when he was 14 in 1839 and continued to make entries in it until 1854. 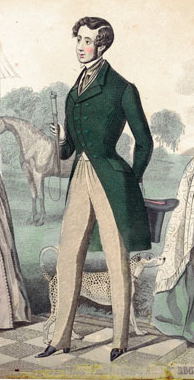 In 1842, as he approached his 18th birthday, he entered the world of sociables, dances . . . and young ladies. Over the next few years he attended dozens of dances each year, sometimes several a week, always carefully describing and comparing the ladies he met there. In the first few years of the journal he seemed to favor the semi-private “cotillions” sponsored by local dance teachers. In the late 18th and early 19th centuries, the cotillion had been a separate dance, with its own figures and musical form. 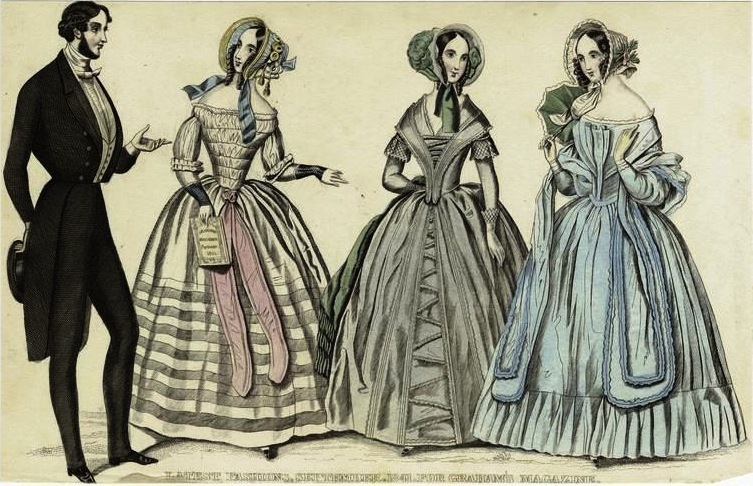 By the 1840s, the term “cotillion” meant not only a dance party but it had become interchangeable for “quadrille,” another form of group dance. 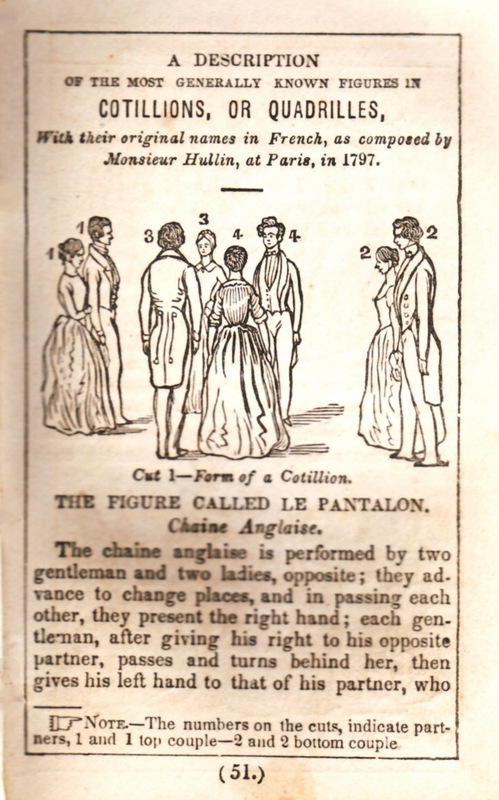 1840s quadrilles/cotillions were dances that were done by four couples in a “square dance” formation; see the illustration right from Philadelphia dance master Charles Durang’s 1848 dance manual, Terpsichore. Each quadrille was made up of a set of five sections or “figures,” and each figure was repeated four times. As in modern square dancing, a Master of Ceremonies would usually call out the figures to be done. 16 March 1842. It was clear and very pleasant all day with the wind from the NW. The thermometer at 5 1/2 a.m. was at 57 degrees, at 1 1/2 p.m. it was at 52 degrees. I was at the office all day and in the evening I was at Mr. Wales’ last cotillion party – I danced 11 sets. I got up at 5 a.m. and got to bed at 1/4 of 1 a.m.
11 February 1843. In the evening I accompanied Lydia (his sister) to Mdme Hazard’s cotillion party to which place we were admitted by tickets procured through the kindness of Miss Adriana Brinckl. On entering the room, and for sometime afterward, I was under the impression that it would be rather a dry affair for me, for I had been told visitors were not permitted to dance. I, however, was determined to dance, if I could possibly get permission, which I did after having a little confab with Mr. Hazard. Mdme Hazard and her husband, Paul, had come to Philadelphia from the Paris Opera in 1835. Paul was the teacher of Augusta Maywood, America’s first internationally renowned ballerina. 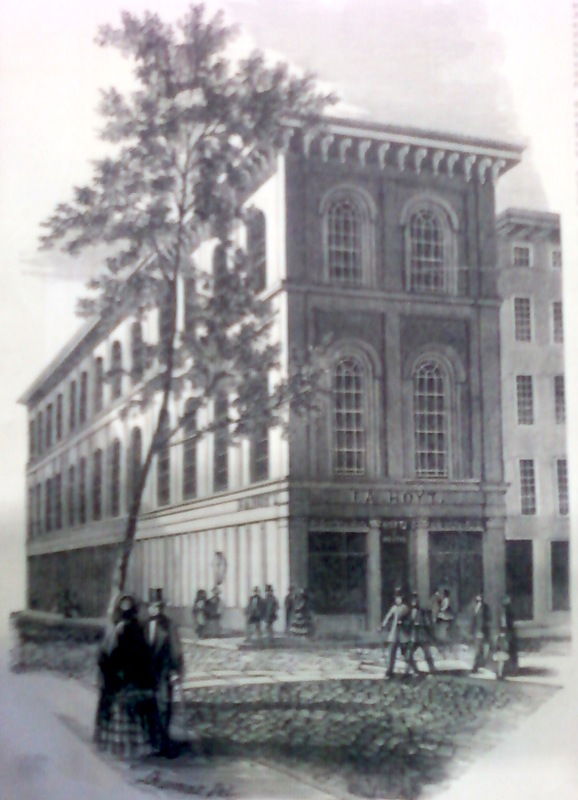 Both Hazards, as well as Henry Whale, taught at one of the most fashionable public spaces in the city, the Assembly Buildings on the southwest corner of Chestnut and 10th Sts., pictured in an 1853 lithograph, left. The buildings extendend all the way south to George (Sansom) St. There were retail spaces on the first floor and a restaurant in the basement. The second floor was devoted to two large and quite beautifully decorated salons, pictured right. The Grand Saloon (salon) was 120 feet long and adorned with 11 ten-foot long mirrors on one side. Described as “by far the most magnificent in our city,” it was leased to dance masters and also used for lectures, balls, performances and meetings. 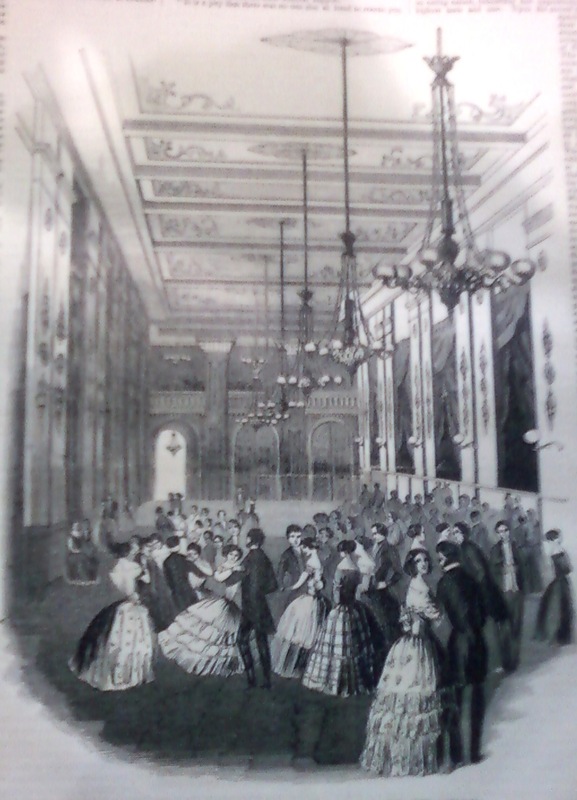 In the 1840s there were more than a dozen dance masters in Philadelphia, competing to fill classes and to sell subscriptions for series of cotillions or dances. In addition to being places where students could practice what they had learned in classes, these dances provided an important social outlet for young, genteel Philadelphians; they were some of the few places the sexes could mix freely in public. 9 March 1843. Among the prettiest of the ladies there, I may class Miss Wallace, Miss Witman, Miss Blackwood, and one other whose name I cannot remember. These fair creatures lit up the room as it were by magic, with smiles, which came from their exquisitely formed mouths and piercing eyes which inspired all the poor fellows that were in reach of their charms with jealousy and love. At about 11 o’clock had a most sumptuous supper, with all the delicacies that could be obtained. 24 March 1847. In the evening went up to the Walnut Street Theater to see the far-famed and much talked of Viennoises Danseuses, being 48 in number composed entirely of children. The first dance, viz., “Pas Des Fleurs” was certainly the most beautiful spectacle I ever witnessed. The grouping of the dances were indeed superb. It would be impossible to describe the various movements made by them, and with such accuracy as was really surprising among those so young. The second dance “Pas Horrois” was a very beautiful thing, it was performed by only 24, one half of which were dressed in male attire. The last dance, entitled the “Grand Pas Oriental” was superb. The groupings in this piece were beautiful indeed, and the rapid changes through which they passed with the white and red scarfs was astonishing. In this piece one half of the dancers are dressed as Moors. These dances are surely worth seeing by everyone. He truly enjoyed and appreciated dancing. 3 November 1847. At the office all day, until about 1 p.m. Then went up to Mr. Edward Roberts for Ma and Lydia who had been spending the day there to have them come home by request of Mrs. Crim (his landlady), as she was to have a dance in the parlor this evening. They insisted upon my remaining to tea which I did. Left there about 1/2 past 7, went home & dressed, and entered the parlor about 1/4 of 9. The company was composed principally of the boarders though there were some few strangers. We had a fiddler and kept up the dancing until about 1 a.m. spending a delightful evening. I made the acquaintance of Miss Borden this evening, one of our boarders, who has been here for some time though I had not become acquainted. She is quite an interesting young lady, and I am much pleased with her, though I must say she did not treat me very well regarding an engagement I had to dance with her. I suppose it was not intentional, as she afterwards made an apology. Joseph W. Erwin and Caroline A. Borden were married on July 23, 1850. They bought a home west of Broad St. on Schuylkill 4th (19th) and Cherry Sts. near the original Wills Eye Hospital and raised two daughters. 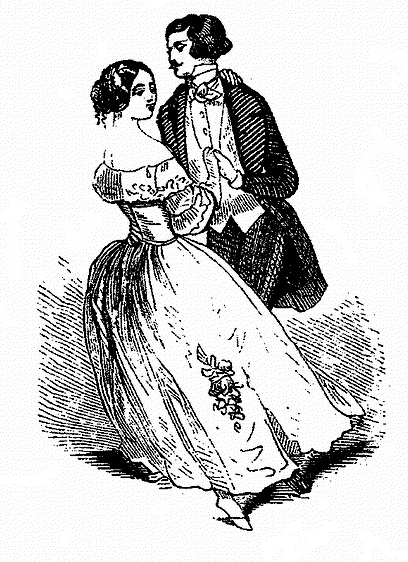 Dancing was a very important part of the courtship and mating ritual of mid- 19th century Philadelphia. Athough rules of deportment and etiquette on the dance floor were strict and dances took place under the watchful eyes of chaperones or dancing masters, young people still found the means for the flirtation and intimacy that would lead to solid, lifelong middle-class relationships. • The illustrations of the Chestnut Street Assembly Building are from an original copy of Gleason’s Pictorial Drawing Room Companion at the Free Public Library. • The quadrille illustration, above right, and waltzing couple, left, from Durang’s Terpsichore are from original editions in my personal collection. • If you’d like to read more of the journal of Joseph Warner Erwin, Bryn Mawr College hosts an on-line transcription annotated by S. Hamill Horne here.